How does the Managed Workstation service deliver software? How does the Managed Workstations Service deliver software? The Managed Workstations Service (MWS) delivers software through a centralized process. Additionally, we provide a standard image that includes a basic set of applications, such as Microsoft Office and Google Chrome. Software distributed via the centralized process is available for install through the Software Center. We can deliver applications to an individual computer, to all computers in a department, or to all managed computers. More information can be found below. How do I use Software Center to install software? Click on the application you want, then click “Install”. The application should install right after that, although it may hide itself for the duration of the installation. You may be asked to restart your computer after the installation has completed. 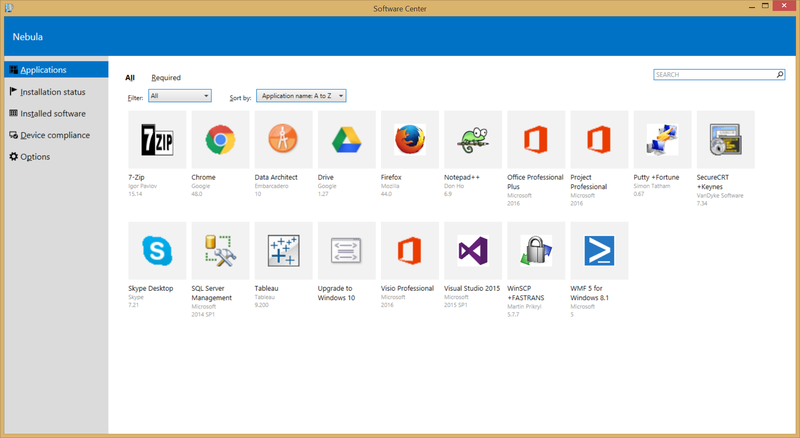 You can use the Software Center to install the current version of Office, if you computer doesn’t yet have it, or upgrade your version to the most current version of Office we support. You can visit UWare for more info on installing Office, and Email and Calendaring for info on configuring Office. Install the application on your own. If you install the application on your own, when your workstation needs to be rebuilt, you will need to reinstall that application which may delay your ability to get work done. At that later point in time, you may have lost the software. For this reason, we strongly encourage all customers to get the application added to the Software Center. NOTE: you are always responsible for licensing and compliance for any software you download or install. You may request that we add any application that isn’t already available in the Software Center: Application Package Request form. Adding an application is generally a billable service. Once the application is added, it will be made available to all managed computers, unless there are licensing or other restrictions that require otherwise. Software is current and meets UW expectations, e.g. the vendor issues patches for known vulnerabilities. You have licensing for the software. Where possible, we’d prefer to centrally distribute software which is licensed for all of the UW versus software which is licensed for a few. If you are interested in this option, fill out the Application Request form. Managed Workstation does not include support for software which customers request that we package. If someone using your software has a problem, we can help via consulting rates. Manage workstation does include support for problems that involve installing packages. We regularly review existing application packages. When software no longer meets our expectations for currency, we will stop distributing it, and you will need to re-engage with us to get a fresh, updated application ready (and yes, this implies further billable activity). Before we remove an expired application package, we will attempt to contact the original requester or contact provided to let them know. We reserve the right to stop providing a package for reasons not specified here. Installing applications on your own usually requires that you have local admin privileges on your managed computer. You, and the University, are at greater risk if you have local admin privileges and/or install applications on your own. We strongly encourage you to discuss your needs with your manager before proceeding. Applications you install fall outside the standard support we provide, so you will be responsible for licensing, compliance, retaining required media, and documenting specific software settings. Note: We may notify you that the software that you installed has security weaknesses or other problems. If a solution cannot be found, you may be asked to remove the software.